USS Arizona (BB-39) was moored inboard of the repair ship Vestal (AR-4) when the Japanese struck Pearl Harbor. 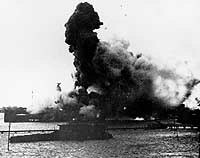 Early reports claimed that she had been hit by one torpedo in the first part of the action. However, this appears not to have been the case, and the destruction of the ship was entirely the work of Japanese horizontal bombers, which struck her with several bombs. Some of these caused damage to her after and midships areas, but their effects were minor compared with what resulted from one that penetrated beside her forward turrets. 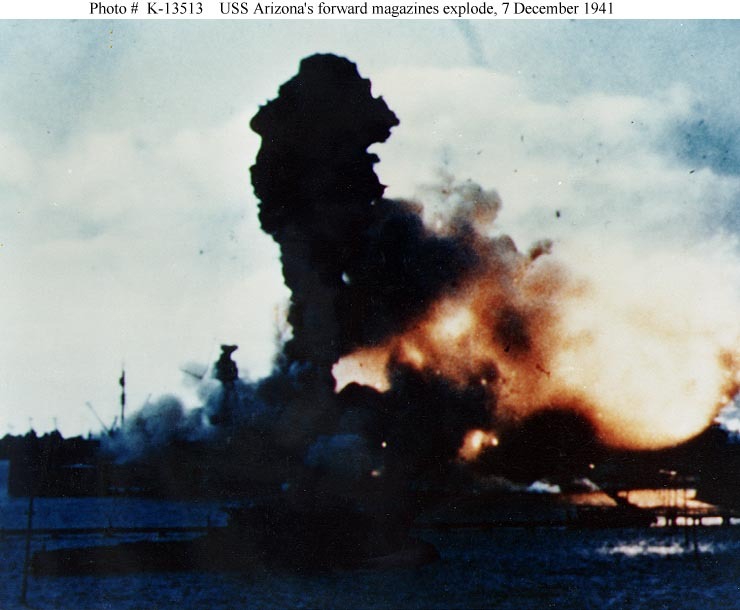 The massive explosion that followed has never been fully explained, since the bomb apparently did not pierce Arizona's armored deck, which protected her magazines. Many qualified authorities have blamed powder storage outside of the magazines as the cause, but this is conjectural and probably will always remain so. In any case, the battleship was utterly devastated from in front of her first turret back into her machinery spaces. Her sides were blown out and the turrets, conning tower, and much of the superstructure dropped several feet into her wrecked hull. This tipped her foremast forward, giving the wreck its distinctive appearance. 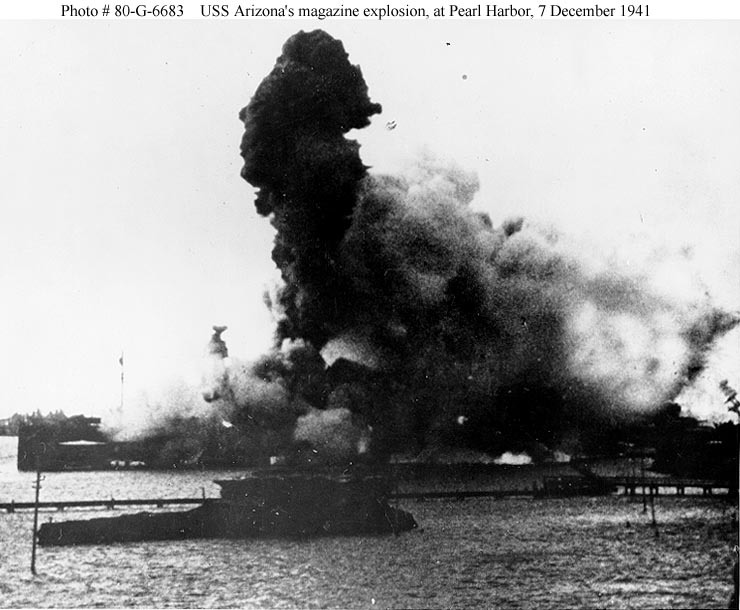 Blazing furiously, Arizona quickly settled to the bottom of Pearl Harbor, a total loss. She burned for more than two days and was subsequently the subject of only partial salvage. Over 1100 of her crew were killed, including Rear Admiral Isaac C. Kidd, Commander Battleship Division One, and the ship's Commanding Officer, Captain Franklin Van Valkenburgh. Their sacrifice, and that of the other men lost at Pearl Harbor, is now permanently memorialized by the USS Arizona Memorial, erected over her sunken hull in the berth it has occupied since shortly after 8 AM on 7 December 1941. This page features views of the explosion of USS Arizona on 7 December 1941 and provides links to images of the ship soon after her loss. 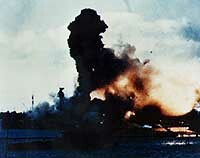 Wreck of USS Arizona, after 7 December 1941. Electrician Arthur C. Manlove, USN. 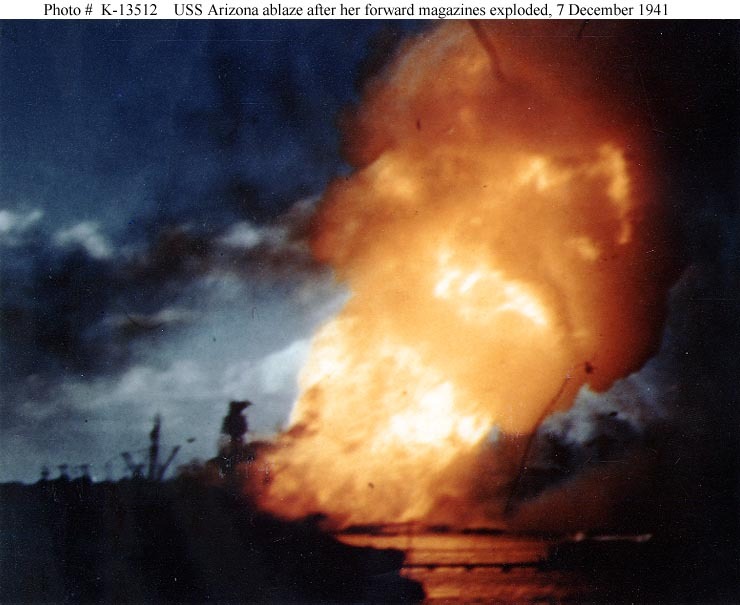 Forward magazines explode on USS Arizona (BB-39), after she was struck by a Japanese armor-piercing bomb. At far right is the mainmast of USS Oklahoma, heeled over sharply to port as she capsized. Slightly to the left of Oklahoma are the forward turrets of USS Tennessee (BB-43), with the rest of that ship covered by the blast from Arizona's explosion. At far left is the bow of USS Vestal (AR-4), moored outboard of Arizona. 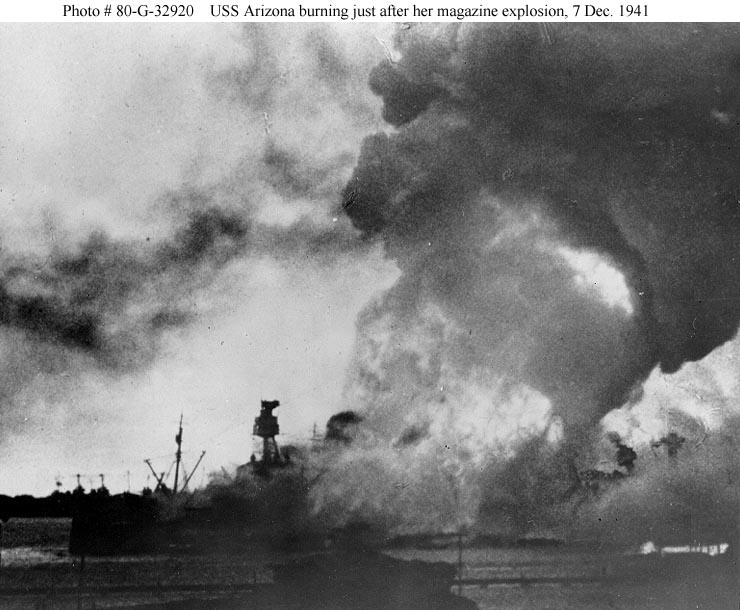 USS Arizona (BB-39) ablaze, immediately following the explosion of her forward magazines, 7 December 1941. 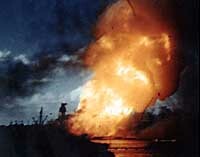 USS Arizona (BB-39) ablaze, just after her forward magazines exploded. 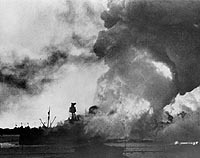 At right, shrouded in smoke from the fire, are the main and foremasts of USS West Virginia, which is listing sharply to port after she was torpedoed. Upright mast further to the right is the mainmast of USS Tennessee (BB-43), moored inboard of West Virginia. The bow and foremast of USS Vestal (AR-4), moored outboard of Arizona, are visible at the left.